Chadsworth Cottage, a classical Southern home, will be built on Historic Figure Eight Island, near Wilmington, NC. The Period Homes Show House, Chadsworth Cottage, was devised to demonstrate that it is possible to build a traditional home, staying true to classical architecture, using readily available products. The original concept in building the house is to show the readers of Period Homes and Traditional Building Magazine that it is possible to build a home with products purchased through the magazine and their web sites. Most of the items used in building the house are stock items. New York designer Christine G.H. Franck was selected to design the house. Simple elegance describes Chadsworth Cottage. The design has been kept simple and straightforward; the goal of simplicity reflects the desired economy as well as the character of North Carolinian architecture. Because the Cottage will be built on the ocean, special measures must be taken. The Cottage will be built on timber pilings and different methods for building will be required. Materials that will standup to the elements must be selected. The landscaping and plant materials chosen must be able to withstand the salt, wind, and intense sun. These are just a few of the problems that need to be solved prior to starting the project. Our plan is to take you with us on this journey, from start to finish. You will be able to contact us at our website with questions and comments. We think that this is going to be a very interesting project, one where we will learn together, and have fun in the process. The Period Homes Show House will be open to the public to benefit the St. Johns Museum and other local charities. When a client says that he wants a house that looks “like it’s always been there,” and he wants a beach house for generous living and entertaining with all of the modern conveniences, with a portico of two-story columns, and he wants it all built for a relatively small budget, the challenges to the designer are many. This is exactly what Mr. Jeff Davis, the owner and founder of Chadsworth Columns, said to me when we began designing Chadsworth Cottage. I was asked to design a house that would demonstrate that a house could be well-designed and well-built without breaking the bank or being overly extravagant. This sort of restraint could be said to be a characteristic found in the best of architectural traditions in North Carolina. So I set out to answer the question of what this house would look like if it had always been there, or had at least been there long enough to have weathered a few hurricanes and a few generations. In an environment that is as beautiful but as harsh as the Carolina Coast, decisions about a house’s design must be informed from the very beginning by environmental considerations. Figure Eight Island is a vulnerable sandy barrier island off of the coast of Wilmington, North Carolina. Typical of many private coastal resort communities, Figure Eight is populated by large vacation homes. Chadsworth Cottage will be located on the northernmost tip of this island and will be built on a buildable area of approximately 50′ x 50′. The site looks out to spectacular open views of the ocean and dunes to the east and a wide inlet to the north and west. While the location of the Cottage at the tip of Figure Eight affords beautiful views, its location also exposes it directly to nor’easters and hurricanes. In an environment such as this coastal environment wind, water, sun, humidity and salt all conspire to shorten the life of a building and thus must become generative forces for the design. This means that the selection of building mass, siding, windows, shutters, doors, exterior finish materials, roofing materials, paints and opening details are of critical importance to the longevity, durability and character of the house. Often the best source of solutions to problems such as these can often be found locally, in both historic traditions and contemporary building experience. Thus, in addition to exhaustive historical, code and materials research, one of my first moves was to meet with the local builder, Jim Murray, whom my client had already selected to build the house. We toured several houses that he has under construction. This early teamwork has introduced me to numerous local details and locality-specific material selection issues that have informed the early aspects of the house’s design and no doubt will inform later detailing. Some of these issues that have affected the schematic design and initial material selection of the house are environmental and others are related to the local building codes, but they have all affected the design of the house. Perhaps the most dramatic impact that the flood and storm surge-prone environment has had on the house’s design is the code-required raising of the main level of the house above the base flood elevation so that the ground level of the house is left essentially open. This allows rising water and waves to circulate freely around the wood pilings that support the house with minimum hydro-static pressure. This required raising of the house on a high base immediately affected the precedents that I looked to in designing the house. For example Mr. Davis had shown me examples of Greek Revival houses, earlier colonial houses, and Palladian designs. As the house must be raised on a significant base of a full story, I felt that a strict Greek model, which would be best located on a low base, was not the best model for this house. However, looking to Palladian models I was able to meet both the clients interest in classical architecture and the need for a raised main level that would locate the service aspects of the house, such as the garages, on the lower level. Local traditions also proved to be useful for examples of houses raised on piers to protect the houses from water or rot. The initial selection of quality wood siding and a metal roof were affected by a desire to select materials that would be both durable and typical for local architectural traditions. Likewise, the inclusion of operable hurricane shutters that can close to protect windows and doors in the event of a hurricane is found both in local building traditions and is also supported by the newest innovations. It is this combining of modern knowledge of building in a harsh coastal environment with historical building traditions and references that will best ground this house to make it look “like it’s always been there,” while ensuring that it will actually be there for a very long time. The views from the site itself with views of dunes, ocean and inlet informed the location of the principal rooms across the back of the house with more public rooms located on the first floor and the owners suite located on the more private second floor. The front of the house is reserved at the first floor for service oriented areas such as the kitchen, laundry and utility rooms and on the second floor is used for the less frequently occupied guest suites. Basic environmental and code issues have affected many of the initial design decisions, but the more developed character of the house and connecting it to Carolinian traditions will come from careful study of historical precedents. The lessons learned from that study, must be adapted to the client’s preferences and desires while at the same time balancing the cost of the project with the quality of the design by relying on stock and modestly priced items as much as possible. Fortunately, Period Home Magazine offers access to a wealth of stock and custom manufacturers of traditional building products that can easily be used to create a beautiful and well-crafted home on a budget that is reasonable rather than extravagant. In resolving the character of the house to match the client’s various ideas about the house, one of my first steps was to best understand his vision for this house. From the outset, the two elements that the client was clear about wanting was a feeling of openness between the principal rooms and a waterfront portico with full height columns. He also gave me numerous images of room interiors and residential exteriors. 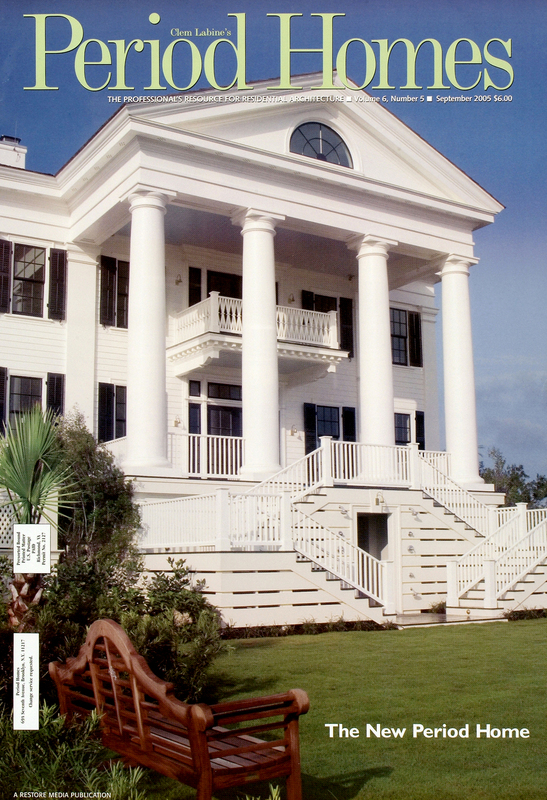 The exterior images were characterized by columned porches made of two-story high columns more typical of a house from the Greek Revival period, while the interior images that he preferred were often more colonial or Georgian in character. In short, there were from the start several different images that the client seemed to have in mind for this house. In trying to reconcile his various design preferences, the environmental constraints and the charge to create a new house that would feel old, I looked most carefully at late-Federal period residential buildings of North Carolina towns such as New Bern, Edenton, Bath and of course, Wilmington. The buildings of this period seem to come closest to Mr. Davis’ image of Chadsworth Cottage – elegant, simple, beautiful, and classically inspired. The first recorded owner of Figure Eight Island was James Moore, who received the title in a royal land grant in 1762. Moore was a brother of Roger Moore, the first owner of Orton Plantation in Brunswick County. In 1775 the land passed to Cornelius Harnett, a signer of the Declaration of Independence. The island subsequently became part of the Foy Plantation at Scotts Hill when James Foy bought the property at auction in 1795 following the death of the executor of Harnetts estate. A commercial seaport operated at Rich Inlet in the early 1800s. Three and four-masted Schooners sailed from England to pick up peanuts, sweet potatoes, peas and soy beans. The waters around the island were plentiful with oysters, clams, crabs, and fish. Barrier islands along the coast had marsh ponies, deer, waterfowl, wild pigs and even cattle (a possible remainder of troops from the Confederate Army). Wild ponies galloped over the dunes before the turn of the century, and pirates were said to have anchored off the coast. Locals crossed Mason Inlet from Wrightsville Beach to beach comb on Figure Eight for many years. In 1954, after devastation from Hurricane Hazel oceanfront property was considered to be of little value; and the Cameron brothers, prominent Wilmington businessmen bought the island for $100,000. Nearly 45 years later, the property on the island has a market value in the millions. Less than 35 years after a bridge made the island accessible, there are almost 400 houses on the only private island with a privately maintained bridge on the Atlantic Intracoastal Waterway. Eight hundred acres of marsh located between Porters Neck and Figure Eight was donated to the North Carolina Conservancy in 1985 to carry out a commitment to monitor the pristine quality of its waters. Scientists come to the island to study the salt water and ground water resources, as well as bird and plant life. Herons, egrets, ibis, osprey and owl inhabit the estuaries. Loggerhead turtles come ashore to nest along the beaches during June, July, and August. Summer is High Season and the island swells with owners, their families, and many houses guests. The summer population comes mainly from North Carolina, Virginia, Pennsylvania and New England. Because of its privacy and security Figure Eight has had movie stars, producers, rock stars, and politicians as guests. Paul Newman, Andie McDowell, Dino DiLaurentiis, Tom Cruise, Julia Roberts, Melanie Griffith and Antonio Banderas have all been guests. Vice President Al Gore and his family vacationed on the island in 1997, along with a cadre of secret service. Figure Eight is a unique island with a private bridge, five miles of empty beach, and no commercial enterprise. The island is a welcome retreat to those seeking a peaceful, private and close-to-nature lifestyle. When I moved the Headquarters of Chadsworths 1.800.COLUMNS from Atlanta to Wilmington, North Carolina, one of my primary goals was to find a special place where I could build a permanent residence. As I began looking at properties, I had two primary considerations. First, since Wilmington is located on the Cape Fear River, and close to the Atlantic Ocean, I wanted an unobstructed view of the water. I had to decide whether I wanted to be on the Intracoastal Waterway or on one of the barrier islands. Second, I had to have a secure property. Part of my job as Founder and Principal Designer for Chadsworth’s 1.800.COLUMNS requires that I travel extensively, so I am frequently away from home. After looking at many sites, I chose Figure Eight Island, because it is a private island with approximately 400 homes and has excellent security. The only access to the island other than by boat is by a privately owned bridge. Figure Eight Island has the only private gate on all the Intracoastal; it is privately owned and maintained by the homeowners. As soon as I saw the property on Figure Eight Island, I knew I had found the right place. My other homes are very traditional, so I thought that I would do something more contemporary and modern. I thought if the house was made of poured-in-place concrete it would be less expensive, and would withstand hurricanes that are seasonal to the area. After studying various designs for the house, I realized that building in that manner was actually going to be more expensive. And somehow, I did not feel that a contemporary home would be right for me. North Carolina has a lot of historic towns on its eastern coast, and as I traveled through them, I found that I really wanted something very simple, like a Colonial cottage with columns. Once the decision was made to build a classical home, everything seemed to fall into place. I was going back to my roots and tradition with a classic cottage. I have always loved classical architecture, and feel very strongly about promoting it in my business. As a member of the board of directors for the Institute of Classical Architecture, I believe classical architecture is the basis for all architecture, and anyone building a home to have a fundamental understanding of classical architecture. Figure Eight Island is steeped in history, and goes back to a royal land grant. The second owner of the island, Cornelius Harnett, was a signer of the Declaration of Independence. In keeping with this tradition, I decided that I wanted the house to look at though it had been on the island for 100 years. With its 2-story portico and columned façade, Chadsworth Cottage will provide a grand vista and a beacon for anyone coming down the Intracoastal Waterway. Chadsworth Cottage was devised to demonstrate that it is possible to build a traditional home, stay true to classical architecture, and use readily available products. I wanted to build the house as I envisioned it, but at the same time keep building costs down. I decided that all building materials to be used in the house should be materials that were readily available, not products that had to be designed or custom made especially for the house, which elevate costs dramatically. Furthermore, the area has been hit by five hurricanes in the last 10 years, and since the house is located on a barrier island, it was imperative for it to be structurally sound and able to withstand winds of up to 140mph. The next step after deciding what type of house I would build was selecting the architect and builder. It was important for all three of us to work together from the beginning. I didnt want to have an architect design the house and then hire a builder. I wanted a coordinated team effort. We had many discussions and each of us had to compromise, because of the stringent rules that apply to building on ocean front property. The building site is not very large, approximately 50 ft. x 50 ft., with the set backsso we had to make the house foot-print smaller than 2,500 sq. ft. Then, the house has to be raised up on piers. The first floor will be an area where I can entertain my friends, with a great entrance hall, living room, dining room and study. The second floor has two guest suites and a master bedroom suite, which runs the length of the house (approximately 48 feet). I wanted the third floor to be a personal study and office where I can work, read, relax with my German Shepherd and enjoy the view. It was important that the furniture I have, as well as any I plan to purchase, fit in the chosen space. Because of my involvement with the Institute of Classical Architecture, I had been exposed to many classical architects. I hired Christine Franck, whom I have known for years and who teaches at the Institute, because of her innate sense of design and her ability to work well with clients. Although builder, Jim Murray, had not previously worked on Figure Eight Island, I saw some of his houses in Historic Wilmington, and felt he would be the right man for the job. It is important to me that I have a cost-efficient project with no overruns. Ron understands my concern, and will work with me to complete the house on time and under budget. I am happy with the team that I have selected to design and build Chadsworth Cottage and about the way the project is progressing. Ultimately, I will have a house that looks as though it has been on the island for hundreds of years, and will be practical as well as beautiful–a house that I can be proud of. Jeffrey L. Davis is the Founder and Principal Designer of Chadsworths 1.800.COLUMNS, a leading manufacturer and distributor of architectural columns for home and commercial use. Founded in 1987 and headquartered in Historic Wilmington, North Carolina, Chadsworth is a privately held corporation. Mr. Davis is a graduate of St. Andrews College, and a member of the board of directors of the Institute for Classical Architecture. Mr. Davis basic strategy as Founder and Principal Designer of Chadsworth is to provide superior and affordable columns to every customer, whether architect, designer, or homeowner. Chadsworth has successfully developed a diverse product line that caters to the individual needs of its customers. Chadsworth produces columns, representing all five orders of classical architecture. Davis is a leader in the building industry, and a well-known authority and speaker on Classical Architecture and the History of Columns. He has been a guest on Home Again with Bob Vila, and serves as a technical consultant for the show. He has appeared on national television on Home Again With Bob Vila, The Christopher Lowell Show, Michael Holigans Your New House, Curb Appeal, and Haven with Joy Philben. Christine G. H. Franck is a designer and educator in private practice in New York. Ms. Franck earned a Bachelor of Science in Architecture from the University of Virginia and a Master of Architecture from the University of Notre Dame. Before establishing her own office in 1998 to focus on architectural design and education, she interned with the office of Allan Greenberg, Architect. In 1996 she was appointed Adjunct Associate Professor at the University of Notre Dame Rome Studies Center. She has an extensive background in developing and directing architectural education programs specializing in architectural classicism. In 1996 and 1997 Ms. Franck co-directed the Prince of Waless Institute of Architectures American Summer School Program. She has also directed The Institute of Classical Architectures Summer Program in Classical Architecture for four years from 1998 to 2001, and the Institutes Rome Architectural Drawing Tour from 1998 to 2001. Ms. Franck was the first Executive Director of the Institute of Classical Architecture and now serves on the Board of Directors of the Institute, the Advisory Council of the Institute and is Director of the Institutes Academic Programs. She has traveled extensively including extended study tours in Carthage, Tunisia; Bath, England; Rome, Italy; Clisson, France; the Netherlands; and throughout the United States. Her design sensitivity was developed at an early age in her hometown of Williamsburg, Virginia. She is also the author of the forthcoming Jose M. Allegue: A Builders Legacy. Murray Construction Company of Wilmington, NC was selected to build The Period Homes Show House, Chadsworth Cottage, on Historic Figure Eight Island, near Wilmington, NC. Period Homes Magazine Presents our Show House Project, Chadsworth Cottage. The original concept in building the house is to show the readers of Period Homes and Traditional Building Magazine that you can build a home with products purchased through the magazine and their web sites. Most of the items used in building the house will be stock items used by any builder, architect or designer. — Heightened awareness of and interest in your product among affluent consumers and trade professionals. — Access to homeowners committed to traditional style and classical architecture and the professionals (architects, designers, builders) who help them achieve it. — Editorial Product Mention in Period Homes Magazine. Join us to celebrate Americas love of classical architecture and style. Be a part of the 2002 Chadsworth Cottage. Your product will reach over 35,000 trade professionals in our magazine, as well as thousands of affluent consumers that will tour the house to benefit the St. Johns Museum and other local charities. This entry was posted in CHADSWORTH COTTAGE and tagged Chadsworth Cottage, Chadsworth's 1.800.COLUMNS, christine franck, columns, featured products, Murray Contstruction, Period Homes Magazine by Chadsworth Columns. Bookmark the permalink.